Pediatricians have become increasingly concerned about the growing use of selective serotonin reuptake inhibitor (SSRI) antidepressant use among pregnant women, especially since animal studies have suggested these medications may increase the incidence of anxiety and depression in their offspring. Could this association be true for humans? A lead article in the June 2018 issue of JAMA Pediatrics suggests yes. Neuroscientists at the Department of Psychiatry, Columbia University Medical Center, using MRI scans, studied the centers of newborn brains that most control emotions. They compared the findings of infants of mothers whose depression was treated with SSRIs during pregnancy with depressed mothers who did not take SSRIs, and pregnant mothers who were neither depressed nor treated with these medications. The findings revealed that babies whose mothers had taken SSRIs during pregnancy showed changes in the regions of their baby’s brain that were associated with emotional development, namely the amygdala. Also, The National Registry Study of more than 15,000 prenatally SSRI-exposed offspring found increased rates of depression in adolescents. A word of caution: even the authors of this study reveal concerns about the conclusions because it is very difficult to do psychological studies where all the variables are controlled. 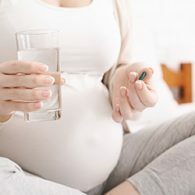 One possibility is that women who were treated with SSRIs during pregnancy were more severely depressed, and the resultant changes in their baby’s brains were due to the severe depression and not the medication. An important point of this study is it raises awareness that healthcare providers should be more selective in prescribing SSRIs, and pregnant mothers may want to seek safer forms of treatment, such as the self-help skills that we mention in our most recent book, The Dr. Sears T5 Wellness Plan, Makeover Your Mind and Body, Five Changes in Five Weeks. Many physicians believe that the increase in SSRI prescriptions for depression during pregnancy is due to both the lack of time a healthcare provider has to customize self-help skills for the mother and the general lack of expertise in treating depression during pregnancy. Studies like this are the reason that our trademark teaching in the Dr. Sears Wellness Institute coaching courses is Make Your Own Medicines®. The good news is self-made antidepressants are one of the top medicines you make by practicing the four pillars of health we teach in the Dr. Sears Wellness Insitute online Health Coach Certification courses classes: Lifestyle, Exercise, Attitude, and Nutrition (L.E.A.N. ).